The only one in the interior of Sarawak, the Meligai Hotel at Kapit commands unrivalled view of picturesque Batang Rajang River that sprawled over undulating terrain of mountainous background covered by virgin forest. 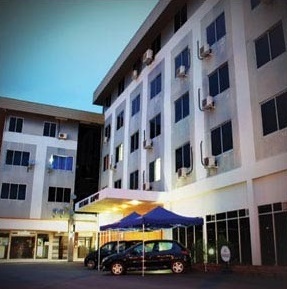 Situated in the heart of Kapit Town, the hotel is 5 minutes driving from wharf, the landing and taking-off point of river transportation for both down and up river travelers and commuters. ‘Meligai’ or ‘Padong’ in Iban is a living quarter or a room within the longhouse constructed exclusively for beautiful and highly adored maidens to stay with all the privileges of a princess. The hotel being the only one and situated higher than any other buildings at that time was most appropriately named Meligai where visitors would stay and treated with Iban hospitality. Hotel Meligai built in late 70’s, is the product of one of the families of earliest Iban migrants to Rajang Basin, the late Tun Jugah anak Baring, who finally settled in Kapit. Address: Lot 334, Jalan Airport, 96800, Kapit, Sarawak.